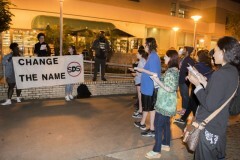 Tampa students host vigil, oppose building named for homophobe and warmonger | Fight Back! Tampa, FL – Over 30 students gathered for a vigil, March 29, in remembrance of the LGBTQIA+ people murdered by U.S. militarism. The event was held in response to the University of South Florida (USF) administration’s defense of LGBT-phobic and militaristic C.W. “Bill” Young. Young was a senator and member of the Johns Committee in Florida, which persecuted hundreds of LGBTQIA+ people across the Florida university system. Students for a Democratic Society (SDS) is currently waging a campaign to change the name of a building on campus that honors Bill Young. When SDS first confronted USF administrators about changing the name of the C.W. Bill Young Hall in late 2015, administrators refused SDS’s demand. They responded to SDS by saying, “Facilities may be named for an individual who has distinguished himself or herself through significant contributions to the university.” Administrators later elaborated in a meeting with SDS that Bill Young’s contributions were related to his support of U.S. military programs on campus. USF administrators stubbornly support Bill Young’s legacy on campus. The administration even acts similarly to the Johns Committee. “As student activists they actively try to silence us with threats of police intervention, but have no problem allowing preachers to harass students and spread their hateful messages of on our campus.” said Tori Stratis of Tampa SDS. The vigil ended with an announcement by SDS, stating that the campaign to #ChangeTheName is shifting in a more militant direction. Jack Ling of Tampa SDS said, “USF administration has left SDS and the student body with no other route for change than direct action against admin’s complicity in homophobia. Students are tired of admin’s excuses, and we will have our voices heard." SDS’s first action to mark the changed character of this campaign will be a protest on April 19, 1:00 p.m., on the Marshall Student Center lawn.